This is a limited 2-day only sale that will expire at midnight on Thursday, March 17, 2011. Click here to buy now or for more information about the deal. Quantities are limited so don’t miss out! Limit 1 per order. Valid for 1 panoramic wall mural only. Not valid with other offers. Shipping included. Give your walls a much-needed blast with today’s deal: for $35, you get a 4-foot-wide, 1-foot-tall panoramic wall mural shipped to anywhere in Canada (an $86 value) from Larger Than Life Prints, a Philadelphia-based wall-graphics wonderland. If your walls are screaming for a larger mural, you can upgrade (starting at 60″x15″) and simply pay the difference ($19-$49) at checkout. Larger Than Life Prints specializes in wall art that combines modern materials with state-of-the-art digital-production technologies. 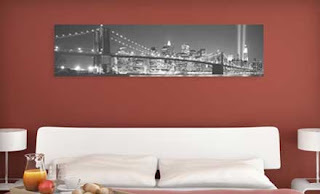 With today’s Groupon, you’ll receive one of its panoramic wall murals, 48 inches by 12 inches in size. Browse the selection of cityscapes and landscapes and order online. Keep it Canadian with skylines of Toronto, Vancouver, or Calgary, or explore other cityscapes from around the globe. Tropical and mountain scenes are also available for two-dimensional glimpses of nature, as well as street art, animal images, landmarks of the ancient world, and more. Think not on frames or complicated mounting procedures; all murals are printed on fabric paper using eco-solvent digital inks and are designed to adhere to any kind of wall material without leaving residue or damaging the underlying surface. If you need to leave town because a band of renegade apiarists is dangerously close to discovering the galvanized-steel hive stocked with superbees in your neighbour’s backyard, simply peel the mural and go—it’s safe to remove and reapply up to 100 times. LTL Prints’ wall murals can spice up sawdust-flavoured office walls, and they make great gifts for birthdays, Burton Gilliam Day, or most any day. All LTL Prints’ wall graphics are made in the United States, printed on demand, and shipped within 48 hours. With today’s deal, shipping (normally $6) is included; if you need the shipping expedited, just choose to pay extra during checkout.